Cheesy Broccoli Soup is always a favorite in my house but then again, any soup is a favorite in my house. A small bowl of soup paired wit a small garden salad is perfect for lunch. 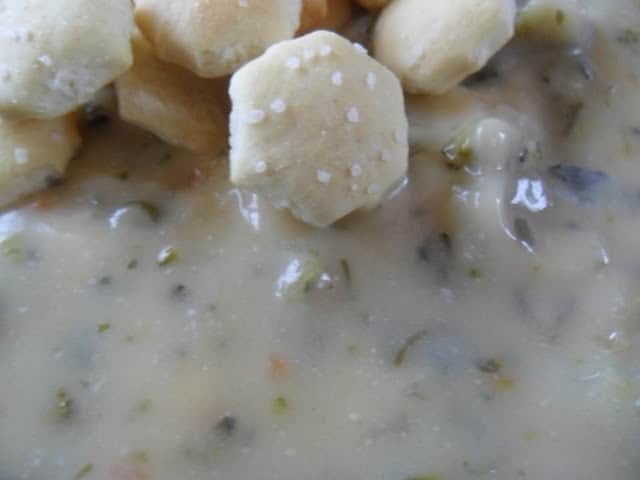 Top bowls of cheesy broccoli soup with flavored oyster crackers. We have several different flavors to choose from such as chicken noodle soup flavored crackers, original ranch oyster crackers and taco flavored oyster crackers. The name broccoli comes from the Italian word for “cabbage sprout” and indeed, broccoli is a relative of cabbage, Brussels sprouts and cauliflower. This deep emerald-green vegetable comes in tight clusters of tiny buds that sit on stout edible stems. It’s available year-round, with a peak season from October through April. Look for broccoli with a deep green color, the buds should be tightly closed and the leaves crisp. Refrigerate unwashed, in an airtight bag for up to 4 days. If the stalks are tough, peel before cooking. Broccoli, a member of the cruciferous family, is an excellent source of vitamins A and C, as well riboflavin, calcium and iron. A delicious and cheesy broccoli soup. 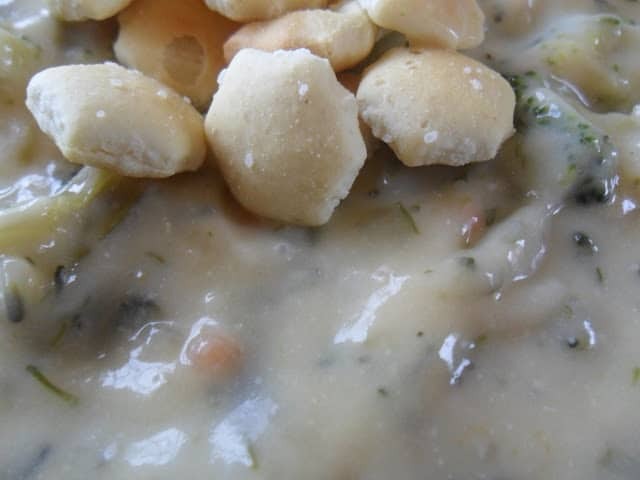 Serve with flavored oyster crackers. In Dutch oven, saute' carrots, celery, onions and garlic in hot oil. Cook until tender. Stir in butter until melted. Whisk in flour until bubbly. Stir in water, chicken broth, bouillon cubes and Worcestershire sauce; heat to a boil, reduce heat to simmer. Add dried thyme, salt, pepper to taste and milk. Stir in broccoli, cheeses and bacon. Stir until cheese is melted and soup is heated through. 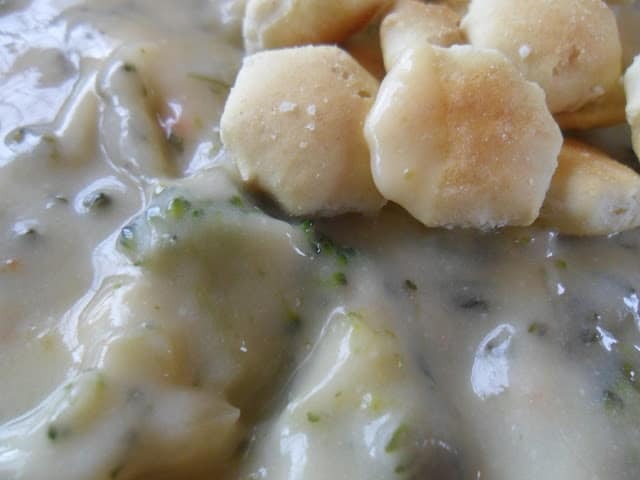 If you like soup as much as we do you’ll love this soup too. Old Fashioned Ham Bean Soup.